Today I actually get to do a review of a book I just read - Prospero Lost by L. Jagi Lamplighter. Miranda, daughter of the magician Prospero from Shakespeare’s Tempest, lives in the modern age. Upon discovering that her father has gone missing, she must discover the location of her other siblings and convince them to save their father, before the Three Shadowed Ones destroy the Family Prospero. She is accompanied by her company gumshoe, an airy spirit stuck in a body that looks a bit like Humphrey Bogart. Humor, mystery, wonder. Recently I asked around for urban fantasy that does not lean left. This is one the books recommended to me as "half urban fantasy and half Shakespeare meets Dante." I was a bit worried at first that I didn't know Shakespeare well enough to appreciate it, but it turns out you don't need to have read him at all to enjoy this. 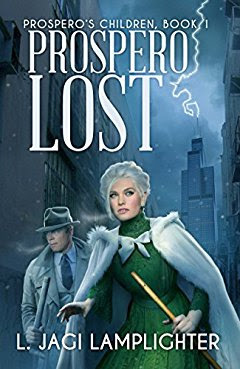 It seems strange to say this about a story based on an existing classic, basically fan-fiction, but Prospero Lost is one of the most original urban fantasy novels I have read in years. Miranda and her siblings are immortal, thanks to Prospero's magic, and she in particular has become something of an ice maiden - remote and removed from everyday human emotion in her magically maintained estate. When a mysterious message from her absent father makes her go out in the world to find her scattered siblings, she starts to remember and become more human. The Prospero family dynamics reminds me a bit of Roger Zelazny's Nine Princes in Amber. Everyone has their own axe to grind. There's mystery, adventure, Fae, demons, and a hint of romance. I would classify this as YA Fantasy and it was a clean read (PG-13). I quite enjoyed Prospero Lost and look forward to the next book in the trilogy.